Trampoline. That’s right, I said it. That rusty old deathtrap in your neighbor’s backyard that his eight year old broke his ankle on months earlier. It’s a garage sale item waiting to happen.I never knew Trampoline was an Olympic event but apparently it debuted in the 2000 Sydney Olympics. I’m pretty sure I watched those but don’t recall seeing anyone bounce up and down repeatedly on some dangerous, Plasticine roundtable while doing somersaults in mid-air.I’ve never been fond of trampolines, partially because I don’t like heights and partially because I’m scared to death of falling off the darned things. I’ve always preferred those inflatable bouncy houses. At least they had walls to use as a safety net. 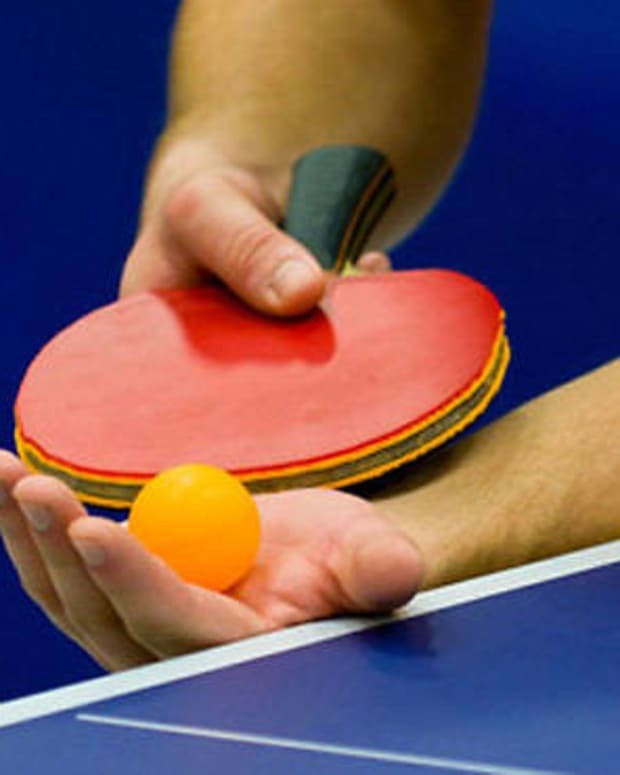 Table Tennis: Men’s – July 28th through August 8th; Women’s – July 28th through August 7th Speaking of things we like to do when we’re drunk, ping pong is once again featured in this year’s Olympics. The funny thing about ping pong is, no matter how good you think you are after tipping back a few, you always run into someone in the bar better than you. Handball: Men’s – July 29th through August 12th; Women’s July 28th through August 11thI’m from New York City, so when I think of handball, I picture glove-wearing, middle-aged men getting together for lunchtime on the upper West Side, sweating it out behind the chain link fences, cursing relentlessly as they pound a racquetball up against the wall with their palms. Archery: Men’s – July 27th through August 3rd; Women’s July 27th through August 2ndI was never any good at archery at summer camp. There were things I was good at, things I was bad at and archery rested squarely in the latter. I could barely get the damn arrow to go ten feet, never mind hit a hay-filled target fifty yards away. Fencing: Men’s – July 29th through August 5th; Women’s July 28th through August 4thIs this a sport any of us really understand? I mean, they use swords called epees, masks which we can barely see through, more padding than a catcher’s chest protector and look like extras from Mortal Kombat. Nobody knows how the sport is scored. We just watch masked avengers swipe the crap out of each other with their thin little swords, then change the channel after we realize no one is bleeding from impact. Badminton: Men’s July 28th through August 5th; Women’s through August 4thShuttlecock. The mere mention of that word is enough to make the immature me chuckle.I’ve seen professional badminton before. It’s insanely fast. In fact, it’s so fast, you can barely see the damn thing fly through the air, so what’s the point in watching? Get more great sports analysis over at Sports Chump. Fireworks Banned from 2012 London Olympics?